The Panama City Beach Chamber is heavily involved in the economic development of Panama City Beach and the surrounding areas, assisting the City and Tourist Development Council in developing a plan and marketing strategy, and bringing in more business parks and high-tech companies. The Bay Economic Development Alliance (EDA) is an organization dedicated to creating new, quality jobs which increase the wealth in the community while sustaining and growing the existing economic base. We work with strategic partners in Bay County, Northwest Florida and the State of Florida to create a vibrant, globally-competitive business climate for Bay County which encourages economic growth, enhances the community’s quality of life and nurtures the creation of high-quality jobs. We operate as a public/private partnership made up of our county, our cities, private businesses and community partners who share our same mission and are committed to working together for economic prosperity. We also believe in collaboration. Serving as the primary link between the local community and the State of Florida’s economic development organization, Enterprise Florida, the EDA works closely with economic development leaders across the state to ensure Bay County and Florida are competitive places to do business. We also work closely with our regional partner, Florida’s Great Northwest, which represents 16 counties across the Florida Panhandle. Together, we all help keep Bay County, Northwest Florida and Florida a competitive place to do business. Please visit bayeda.com for more information. 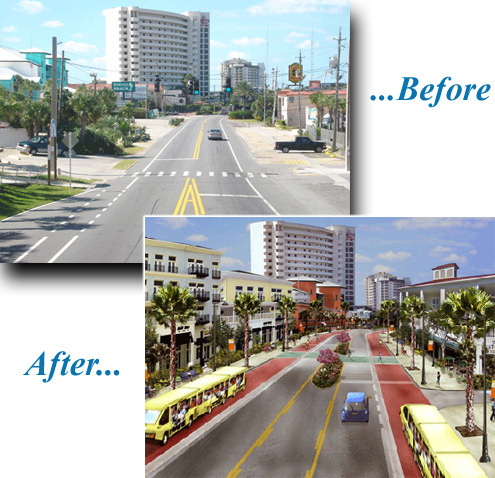 The Panama City Beach Community Redevelopment Agency was formed to improve pedestrian, parking and transportation networks and facilities, and to improve the overall aesthetics of Panama City Beach. The CRA is making significant improvements to the transportation network that serves the Panama City Beach tourism corridor by planning and building an integrated system of transportation options to provide efficient, attractive and fun ways to move around town. The CRA plan will provide the infrastructure for an efficient, pedestrian-friendly road and transit system along the Front Beach Road corridor by reconstructing and streetscaping eight miles of Front Beach Road with underground utilities, landscaping, decorative sidewalk and innovative roadway lanes dedicated to transit and bicycle use. The dedicated lane transit facility will provide efficient access to Panama City Beach’s many public beach access points with parking available at two planned multi-modal centers anchoring the east and west entry points to the corridor, in addition to several smaller beach parking lots constructed along Front Beach Road. The CRA plan will complete the transportation network by reconstructing seven north-south connector roads to provide streetscaping, underground utilities, sidewalks, bicycle lanes and additional traffic lanes.